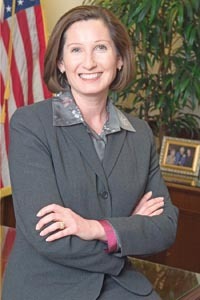 Controversial U.S. Attorney Mary Beth Buchanan of Pittsburgh left office on Monday. The Bush-appointed U.S. attorney, who had been in office since 2001, has been rumored to be considering a run for the 4th Congressional District seat in Pennsylvania, which includes Pittsburgh suburbs and Lawrence, Mercer and Beaver counties. In any event, don’t expect to see her fade away into the sunset. She generated plenty of controversy over the years, including when she prosecuted comedian Tommy Chong on drug paraphernalia charges. Robert S. Cessar has been named acting U.S. attorney, according to the U.S. Attorney web page. Posted: 11/17/09 at 11:10 AM under News Story.